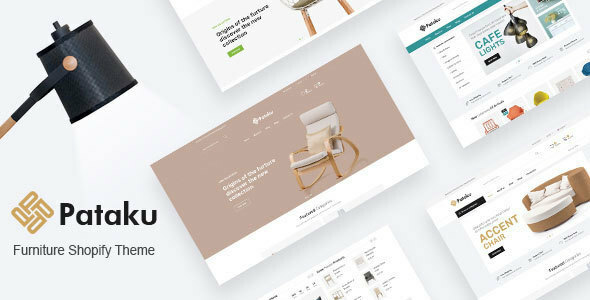 Pataku – Furniture Shopify Theme is a lightweight fresh, and 100% responsive Shopify theme. It is perfectly adjustable for any kind of electronics devices. It is easy to install and also you can preview the sophisticated live demos. This customizable theme is built on a Shopify framework along with powerful Sections. This modern premium Shopify theme is perfect for furniture shops and exterior/ interior design companies. You can edit, customize, and manage your online store, because it has Drag & Drop Page Builder options. Just drag & drop the important elements into your layouts in an instant. You don’t even need any coding skills. Moreover, you will get 4 unique Homepage with several useful pre-built pages in Pataku – Furniture Shopify Theme. Pataku offers Sliders and Unlimited Color Options, so that you can perfectly mix the colors, shapes, fonts, slideshow and banners to give the whole layout an attractive look. It also includes Featured Product, Product with Carousel, 15+ Pre-loader, 404 page, Built Based on Bootstrap 4, Well Commented HTML & CSS files, Google Analytics and more. Each purchase of the Pataku – Furniture Shopify Theme guarantees your lifetime access to future theme updates at no extra cost. So quick install and enjoy the Pataku – Furniture Shopify Theme.